The Florida Atlantic University Max Planck Academy on the John D. MacArthur Campus in Jupiter stands to redefine approaches to STEM (science-technology-engineering and math) education, not just in South Florida, but nationwide. The FAU Max Planck Academy is the latest partnership between FAU, the Max Planck Florida Institute for Neuroscience (MPFI) and the Germany-based Max Planck Society, expanding on similar opportunities for FAU’s graduate and undergraduate students. This unprecedented program will open the laboratories of Max Planck to high school students, allowing them to participate in world-class research and scientific discoveries as part of their curriculum. Six high-achieving FAU High students currently are dual-enrolled in an Academy pilot program, directly learning from scientists – including Nobel Laureates – and spending time in MPFI labs. The students were selected based on the following criteria: National Merit Scholars, strong academic achievement as measured by a high grade point average and an expressed interest in data science. The Academy will be organized as a standalone extension of FAU High School– a nationally recognized, public “Blue Ribbon School” located on FAU’s Boca Raton campus that offers an accelerated pre-collegiate program where students work toward a cost-free bachelor’s degree and high school diploma simultaneously. The Academy in Jupiter will offer a unique and individualized program for students, starting in their junior year of high school. Enriched, honors academic pathways in STEM will be pursued, including neuroscience, biological sciences, chemistry, engineering and computer science. These students will ultimately gain priority admission into the undergraduate Max Planck Honors program which was launched last spring. FAU Max Planck Academy students will assist MPFI researchers in a number of ways, such as engaging in laboratory research, organizing and analyzing big data using machine learning and other advanced computational techniques, or assisting in MPFI’s state-of-the-art Scientific Core facilities, such as electron microscopy, molecular biology, and the Imaging Center. Benefiting from the international presence of MPFI and the Max Planck Society, the Academy experience will lead to extraordinary international networking, mentorship, and study abroad opportunities. “The Max Planck Society has a long history of investing in the education of the next generation of scientists. Our ideal has always been to provide the most promising minds with state-of-the-art resources and opportunities. We have proudly educated thousands of junior scientists at the college, Ph.D. and postdoctoral level, and are now excited to extend the Max Planck model of scientific excellence to the high-school level,” said David Fitzpatrick, Ph.D., CEO and scientific director of MPFI. 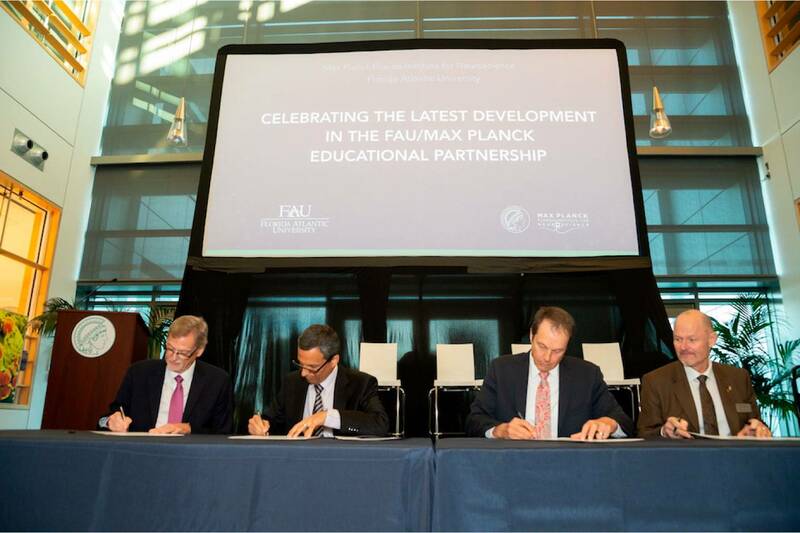 Four years ago, FAU President John Kelly explored expanding the FAU High program to offer targeted educational tracks for specific disciplines. Approximately 35-50 students will be admitted in the inaugural class, eventually scaling up to about 50 students. Beginning in 2019, the highly selective application process will target National Merit semifinalists, as well as the best STEM students from around the world. The first class is slated to begin in fall 2020 and to graduate in spring 2022. Students who successfully complete this exceptional program will earn a high school diploma embossed with both the FAU and Max Planck seals, and at least two years of accelerated college credit – tuition free – leading to elite research experiences and distinction through the FAU Max Planck Honors program and accelerated bachelor’s degree at FAU. For more information about the program and its application process, visit maxplanckacademy.fau.edu.